For years Twin Oaks Senior Living has used a billboard located along westbound Interstate 70, between Hwy 79 and TR Hughes Blvd. to promote the campuses in Wentzville and O’Fallon, Missouri. The 2016 billboard design, which was just erected this month, features resident Chuck Lehr and his wife, Joannie, and comes with an endearing backstory. The 2016 billboard features residents Chuck and Joannie Lehr. 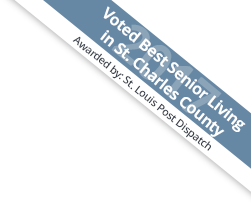 The pair moved to Twin Oaks at Heritage Pointe on May 2, 2011 and were both very active in all the activities and parties at Heritage Pointe, from bingo to balloon making and Chuck even performs magic shows. Joannie passed away on February 15, 2016. Following her death, Chuck made it known to the Twin Oaks staff that one of Joannie’s dreams was to have her picture on a billboard. The staff at Twin Oaks immediately contacted their representative at DDI Media and had the design team create a billboard that included a photo of Chuck and Joannie. While Joannie was not able to see her dream come true, the staff at Twin Oaks Senior Living feel that she is now looking down at her billboard from Heaven. Chuck and Joannie were happily married for 56 years.